January Journal: Day 19 — Ginger writes. Thank you for sticking with me this week. I know I have written a few long posts in a row, so for your sake and mine, I'm hoping to make this one short and sweet. I wanted to share a few of the ways I keep memory work central for myself, separate from the time I spend working with my kids. My #1 way is during my morning walks. I walk nearly every day (more in the warmer months) and I always fill my pockets with my phone, the gate opener, a Kleenex, pepper spray, and my Bible verses. Since I am trying to stay ahead of the kids on Colossians, I take along a folded-up page from our Colossians memory work schedule that the school provided for us. I fold the paper to show only a few verses at a time, but I love having the whole page, because sometimes when I'm reviewing, I want to look back and be sure I'm saying the earlier verses correctly. So I walk with a folded, or unfolded, paper in my hand most days. I love this practice time the most because I feel like my mind more easily focuses when I'm out walking and not at home with a million other demands. Every few days I make myself start all the way at the beginning of Colossians and practice the whole thing, right up to the new verse or two I'm working on that day. It can take 11-15 minutes but I still have over half my walk left. When I get done working on Colossians, I like to review other verses while walking too. Psalm 90 is a favorite, so I say it (pray it) often. Lately I've also been using some of my walk time to go back through Philippians and make up memory tricks. I had learned all of Philippians over a 2-year period back when Story was born, so it's been in my memory for a while but I haven't practiced it much in the last year and I found I was having trouble in a number of places. So now I'm trying to revive it again, with the addition of memory tricks, while I walk. The #2 way I practice memory work is by working on verses in the shower. 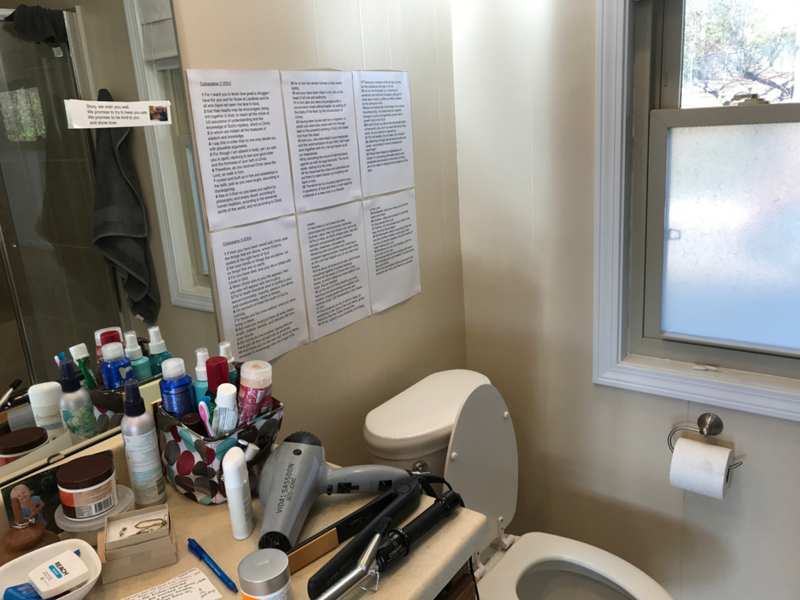 I printed Colossians in large type and put up several pages' worth on the wall behind the toilet so I can see the words while I shower. I don't really care that the pages on the wall aren't pretty. No one sees the bathroom but me and TJ, and we're usually in our bathroom no more than 45 minutes per day combined. I like being able to read over the verses again that I was working on while I walked. A third way that works for me is to write verses I'm reviewing or memorizing on index cards and leave the cards on the bathroom counter. I find this reminds me to say a psalm while I'm getting ready for the day. I learned Psalm 34 a while back, but then went a while without saying it, so recently I've recopied it on cards and have been practicing sometimes while I get ready. The final way I practice memory work is by copying passages in my journal. I was working on Habakkuk 3:17-19 recently and for a couple weeks, every time I would sit to journal (which is probably just a few times a week), I would start by writing those few verses down first. Lots of ways will work! Lots of Scriptures to choose from! Lots of days and months and years to keep at it! Lots of heart transformation to occur!